HPI Baja 5B Forum – Large Scale Forums! Phx123, the winner from our Baja 5B lotto has a very short HPI Baja 5b video clip where he managed to break a few parts (listed here). Livesockets.com also has a video of the HPI Baja 5B in action, this one however was filmed mostly from inside a car following the Baja 5B. Notice how much dust the HPI Baja 5B throws up at the car following it. The HPI Baja 5B is a rear wheel drive 1/5th scale off-road buggy that is nearly 32 inches in length! 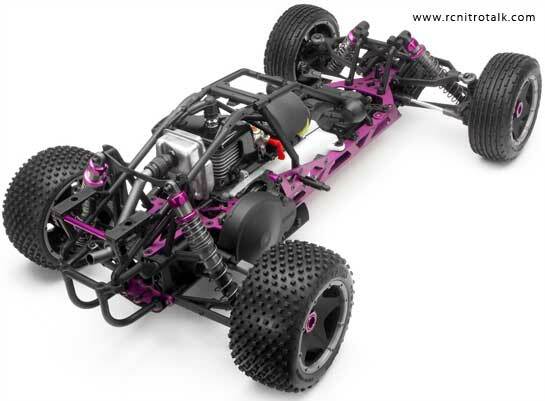 Its design is revolutionary for large scale RC Cars, following the style of classic Baja buggies with long suspension arms for great ground clearance and large suspension travel. The big size allows the HPI Baja 5B’s driving experience as close as you can get to the real thing. Preassembled HPI Baja 5B chassis. Prepainted HPI Baja body shell. Preinstalled high quality FM radio gear with built in fail safe. 6V receiver pack and charger. 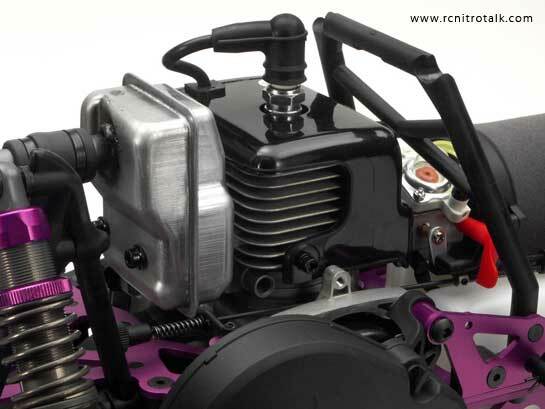 Pre installed massive 23cc gasoline engine providing plenty of power. All you need to do is fill up with standard gasoline and some oil, and off you go! Chassis Design: The narrow channel chassis design made from rigid 4mm aluminum gives the HPI Baja 5B a classic buggy look and extreme stiffness and durability. Long Travel Suspension: The Baja 5B features a fully adjustable double wishbone suspension with long travel aluminum shocks give the HPI Baja 5B excellent off road capability. The narrow chassis design allows for very long suspension arms which results in smooth damping and long suspension travel. The completely new designed shocks are made from aluminum and have 5 dampening settings that can be adjusted externally without removing the shocks. Dual rate shock springs give progressive suspension characteristics on different surfaces making the Baja 5B ready to tackle any kind of surface. Differential: The HPI Baja 5B is loaded with a viscous torque control differential that smoothly delivers the power to the rear wheels. The HPI Baja 5B differential can be tuned using different weight differential oils. Hardened metal is used throughout the drivetrain for high strength and reliable performance. Radio: The HPI Baja 5B is also equipped with a high quality TF-10 radio system and is FM for excellent range and reliable operations without the interferences that can be caused by gas engines to AM radios. And for extra protection, an adjustable failsafe system is included in the Baja 5B radio receiver. The Baja 5B comes standard with a 2000mah 6 volt rechargeable receiver pack and an AC charger. A battery power monitor helps you keep track of the state of the battery charge for more reliable operation. The onboard radio system located on the Baja 5B is protected by a sealed, water resistant housing with an external jack for charging the receiver battery without taking them out of the radio box. The receiver crystal can also be changed through a rubber cap without opening the radio box. Servo: The steering is powered by a massive 347 oz-in torque servo for quick steering. In addition, all servos are water resistant and allow the HPI Baja 5B to be driven in extreme off road conditions. Engine: The massive HPI Baja 5B 23cc gas engine provides plenty of power. The HPI Baja 5B runs for more than 30 minutes on a single tank of gasoline, and refuelling with gasoline costs a fraction of expensive nitro hobby fuel. The powerful 2 stroke engine includes a pull starter, primer, choke, kill switch, and also a high performance dual element foam air filter. Roll Case: A Baja style roll cage made of high impact nylon protects the Baja 5B engine and body shell from crash damage. Wheels & Tires: The HPI Baja 5B comes equipped with special 3 piece bead lock wheels. A bead is bolted onto the wheel to securely hold the tire. No glue is used to mount the tires on the HPI Baja 5B – which makes changing the Baja 5B tires quick and easy. As a result, the wheels can be used again and again with different tires without the hassle of cleaning the wheels and tires of glue. High traction HPI Dirt Buster tires with unique tread patterns in front and rear guarantee good traction on almost all off road surfaces.